“A healthy Outside, starts from the Inside”, as stated by Robert Urich. He wouldn’t be wrong stating that fact, as a person’s digestive system is indeed a life changer. How your body digests food, the micro-organisms that stay in your gut, define your health. Certain enzymes play an important role in aiding digestion of certain food groups. Those foods may otherwise not break down as well as they should. 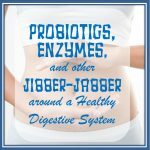 But there’s way too much confusing information on Probiotics, Enzymes and other Jibber-Jabber around a Healthy Digestive System. So in this blog today, I’ll try to explain information in a simple way. Hopefully, we can all implement these little big changes in our lives and move towards a healthier gut! She states that any disorder arising from digestive issues points to these 4 food groups. Consuming these 4 food groups of High fiber, omega 3 fats, probiotics and enzymes can keep your gut and digestive system quite disease free. How to Maintain a Healthy Digestive System? Fruits and Vegetables consist of a lot of fiber. Fiber helps your body digest food more efficiently. These also provide a lot of essential nutrients and keep serious disorders like heart disease at bay. Fiber is found only in plant food. So any part of your food that comes from a plant would have some fiber in it. Fiber can be soluble as well as insoluble. Soluble fiber mixes with water to form a gel-like by-product. This gel reduces the speed of digestion, which helps to absorb more nutrients from the food. It also helps reduce the level of cholesterol and glucose. Insoluble fiber does not mix with water and adds bulk to the stool. This helps to move stool along more conveniently in the intestines. Thus, it helps to keep the intestine clean. Include a lot of food groups, healthy food groups into your diet. Foods that are rick in the H.O.P.E. group are essential to build better cells and maintain good health of the body. Along with the HOPE group, Vitamins like A, D, Minerals like Potassium, Calcium, Iron and Folic acid help maintain good health. Unnecessary fats, sugary foods and other foods with empty calories do not digest properly and make the body work too much for too less. Such foods are better kept away from you and your body. This fact has been emphasized by many people, and if we are still not following it, we must do it NOW! There is no word like too much water. The more water you drink, the better it is for your body. Gone are the days when 2 liters of water were sufficient. 3 -4 liters of water is what everyone would aim at now. Water removes toxins from the body, helps the stool move out easily, and helps in the absorption of nutrients as well. You cannot expect your body to perform if you are unfair to it. Your body won’t perform great if you eat a triple dose of spinach just because it is healthy. It is important to not binge or overeat. Eat good food, in limits as required by your body. Pay attention to the signs and signals it gives you. Your body will always tell you when it is full. It is crucial to eat mindfully and not simply stuff it. You May also like to read 6 Health Benefits of L-Lysine You did not know about! That were some really informative points and also about H.O.P.E , wrt our Digestive system. Great that zenith has brought out this range. Zenith is a perfect brand for supplements. I am using a few, but I didn’t know about this. Thanks for sharing. Zenith supplements are great. I must get this one for my mother in law who has a terrible digestive disorder. Thanks for penning down these symptoms and for sharing the tips to stay rid of it, and seems zenith supplements work really well in curing these problems! Nice post! I’m thinking of buying this product. This supplement is awesome!